A Private Audience! and Step Out Of The Traffic and Heard You! and Snippets of Spring and Custom Made Jewellery and A Cool Drink...aah! The Ultimate Comfort Food and Sheer Beauty and All Is Calm and Good Intentions! and Dolce Vita! A Right Royale Margin! and Happy Summer! and Sailing...Or Drifting? and Time's Up! and Speechless!! Snowdrop Strength and CROWNS & THRONES and Bring Me Sunshine! and HD Digital Touch and Location, Location, Location..? Blooming Victory! and The Cheek Of Forgiveness? and Sail Away! ENRICHING MOMENTS is the title of Judith's new book! 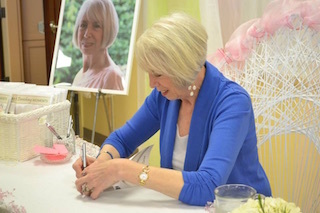 The international book launch happened on Saturday 13th June 2015 in Connecticut U.S.A. at Victory Christian Church, Middlefield. What a spectacular event it was, full of excitement and joy! The above forms are downloadable in Portable Document Format (PDF). To view them you need to use a PDF file viewer such as Acrobat Reader from Adobe Systems Incorporated.